In Phineas and Ferb: Quest for Cool Stuff join Phineas and Ferb as they travel to out-of-this-world places in their newest invention, the A.T.T. (All-Terrain Transformatron). This upgradeable, customizable, ultra-cool amphibious ride helps the boys hunt for lost loot to display in their backyard Museum of Cool. 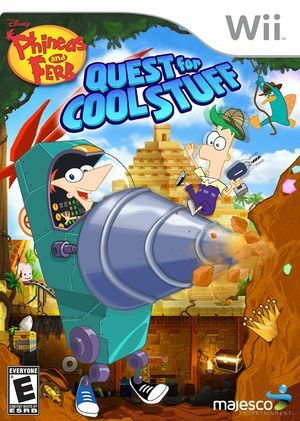 Phineas and Ferb: Quest for Cool Stuff features many of the fan-favorite characters from the hit show, including Perry the Platypus -- aka secret Agent P, Candace, Isabella, Buford, Baljeet, and the evil Dr. Doofenshmirtz, who is determined to unleash his latest creation, the "get-rid-of-cool-stuff-inator" on the Tri-State Area. The graph below charts the compatibility with Phineas and Ferb: Quest for Cool Stuff since Dolphin's 2.0 release, listing revisions only where a compatibility change occurred. This page was last edited on 13 January 2018, at 08:09.